DOES IT SEEM LIKE YOUR DREAMS FOR A BETTER LIFE WILL NEVER COME TRUE? Well, Dr. Kenneth Polke knows that feeling. Ken grew up in a tough neighborhood in Cleveland, known as Collinwood and depicted in the true story and recently made movie "KILL THE IRISHMAN", in the 1950's and 1960's- a neighborhood that would later be known as BOMB CITY, USA because Mafia war bombings and racial riots. Ken saw people all around him struggling and in some rare instances, dying. He watched his working class parents literally work their fingers to the bone to provide for him and his three siblings. And he watched neighborhood kids turn to a life of crime so they could possess fancy cars and beautiful women. 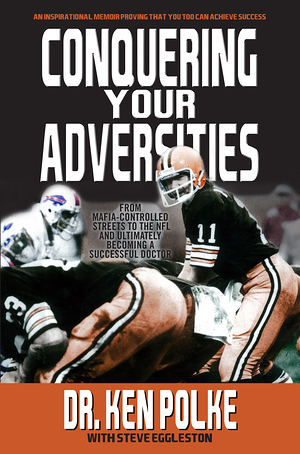 At times the lure of organized crime appealed to Ken as well, but with the support of his loving parents, a Catholic school education, and a belief in his own athletic abilities, Ken learned how to Conquer His Own Adversities and make a successful life, first by playing professional football and then by owning a successful dental practice. Now in "CONQUERING YOUR ADVERSITIES" Ken shares his life story of how he succeeded. But while it is his story, his purpose in writing is to help you, the reader, succeed in your own life. Ken ends each chapter by challenging readers to reflect on their own lives. Poignant questions are posed to the reader and not some psychological mumbo-jumbo (make me feel good) fluff. Answers derived from these introspective and life-changing questions will help motivate the reader to take action.- action that can "CONQUER YOUR ADVERSITIES" and lead to accomplishing your life dreams. If you are ready to put the past behind you and embrace a better future, then you've found the right book to begin your journey to success.